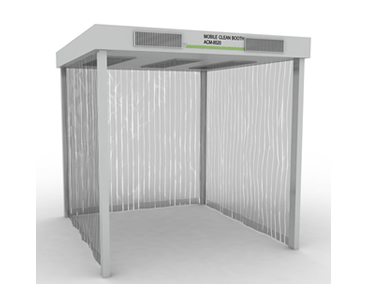 Clean Booth is a portable Clean room system equipped with HEPA Fan Filter Unit, it generates stable and ideal laminar air flow inside. This unit can provides high cleanliness (ranging from Class 100 to Class 10 000) partially in the clean room with excellent flexibility for the various demands of job process conditions. The custom Mobile Clean Room Booth & air tent panel offers unmatched prices, usage and specifications for various research laboratories. The Clean Room Tent offers application in pharma industries (to maintain GMP), Operation theatres, Horticulture, Tissue culture and bio fertilizer labs, Space research, Food processing industries etc. Low installation cost, modular design for fast and easy assembly. Can be set up by modular for larger clean environment area. Compact design, light weight complete with castor wheel for mobility, four sides vinyl transparent curtain. Energy saving design for purpose of localized clean environment. The rooms are freestanding and fabricated of steel with welded gusset plates on each leg support to insure rigidity. Our exclusive rafter ceiling system allows rooms to span without need of internal legs. All framework has an electro-statically applied powder coat finish. Consists of anodized aluminum hat and zee shaped extrusions that are formed to fit steel frame. One inch anodized tees make up cross sections creating a leak free ceiling system. panels manufactured of high density formed fiber core covered with a white vinyl membrane. Tiles are durable, easy to clean and offer both humidity resistance and high light reflection. clear solid vinyl curtain hung to an appropriate height around perimeter of clean room to maintain proper pressurization. Various types of entry/exit systems are offered to best suit personnel/product flow. (overlaps, strips, bi-folding or dual-flex self-closing doors.) Curtains are easily mounted to steel frame by our one piece white PVC mounting track. Simply hook curtains on to track and close the continuous cover. This sleek non-corrosive design creates a tight seal to frame work that prevents contamination from entering the clean room. HEPA filter efficiency to be 99.99% at 0.3 microns and produce 720 to 800 c.f.m. or an average velocity of 90 f.p.m. A prefabricated wiring system is supplied to speed up installation and reduce wiring costs. Assembly personnel just plug electrical components together so an electrician is only needed to connect power to a single point junction box. What makes this system completely user friendly is a leg mounted control box with separate on/off switches for HEPA filters and light fixtures.